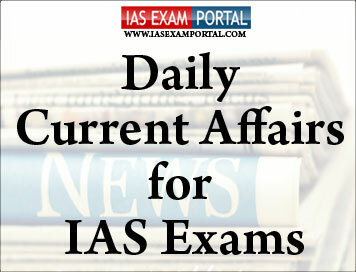 Current Affairs for IAS Exams - 03 February 2019 | IAS EXAM PORTAL - India's Largest Community for UPSC Exam Aspirants. He said small-scale and village industries should be focussed for up-gradation of both technology and marketing skills by rural youth. He also stressed on the need for greater synergy between the private, public and co-operative sectors to create more avenues for skilled jobs in the villages. Mr. Shukla was picked from a panel of several names cleared by the high-power committee, led by Prime Minister Narendra Modi and comprising the Chief Justice of India and the Leader of the Opposition in the Lok Sabha. Mr. Shukla’s appointment comes at a time when the agency is mired in a series of controversies related to a bitter fight between two top officials, former Director Alok Verma and Special Director Rakesh Asthana, both of whom were shunted out following serious corruption allegations against them. In fact, the top post in the agency has been vacant since October 2018 when Mr. Verma and his deputy Mr. Asthana were removed based on Central Vigilance Commission (CVC) report after Mr Verma lodged an FIR naming his deputy Asthana in a bribery case. However, the Leader of the Opposition M. Mallikarjun Kharge submitted a dissent note on Mr. Shukla’s appointment, saying he did not meet the required criteria as he had not worked in any anti-corruption agency. The Enforcement Directorate has initiated a money laundering probe on the basis of the Central Bureau of Investigation (CBI) case against Chanda Kochhar, then managing director and chief executive officer of ICICI Bank, her husband Deepak Kochhar, Videocon Group head Venugopal Dhoot and others for sanction of credit facilities allegedly in violation of rules. The agency will investigate the money trail to determine whether there was any laundering of the funds involved. The CBI registered the FIR last month, also naming Mr. Kochhar’s company Nupower Renewables Ltd. (NRL), Videocon International Electronics Ltd., Videocon Industries Ltd. and Supreme Energy Private Limited (SEPL). The case was lodged following a preliminary inquiry instituted on December 8, 2017, on charges that the bank sanctioned credit facilities of about ₹3,250 crore in violation of its credit policy and Reserve Bank of India (RBI) guidelines. It was also alleged that as part of the quid pro quo, Mr. Dhoot made an investment of ₹64 crore in the NRL through the SEPL, and also transferred the latter to the Pinnacle Energy Trust, managed by Mr. Kochhar, through a circuitous route between 2010 and 2012. The agency found that the bank had sanctioned six high-value loans to various Videocon Group firm. Venezuela President Nicolas Maduro has threatened to bring forward parliamentary elections this year in a bid to sideline opposition leader Juan Guaido's challenge to his authority. The Parliamentary elections are scheduled for the end of 2020. Guaido is the Parliament president and declared himself acting President of the country on January 23. He led a mass opposition street protest in Caracas yesterday demanding Maduro resign and hold new Presidential elections. Meanwhile four major European nations - Britain, France, Germany and Spain - have said they will join the United States and several Latin American countries in recognizing Guaido as interim President if Maduro doesn't call the Presidential elections by midnight on Sunday. In a related development, a top US official has called on Venezuela's military to follow the lead of a general who sided with opposition leader Juan Guaido. National Security Advisor John Bolton said in a tweet that the US calls on all military members to follow General Francisco Yanez's lead, and to protect the peaceful protestors supporting democracy. Yanez had posted a video of himself rejecting Maduro's authority and recognising Guaido, the National Assembly head, as the acting President. “With a range of more than 1,300 km this cruise missile needs a very short time for its preparedness and can fly at a low altitude,” Iranian Defence Minister Amir Hatami said in remarks carried by state television during the unveiling ceremony. Microbial fuel cells (MFCs) are fast emerging as an option for several specific requirements. Now, a startup, JSP Enviro, aims to use this technology to process textile wastewater and additionally generate electricity that will render this exercise energy-efficient. The principle of using the MFC to degrade wastewater is simple. A carefully selected cohort of bacteria is made to act on the textile wastewater placed in the fuel cell. These bacteria are isolated from the very wastewater they are meant to degrade. They feed on the organic material in the water and break it down under anaerobic (without oxygen) conditions, releasing electrons in the process. The bacteria take turns to act on the wastewater and purify it: There are many species of bacteria. If a dye is present in the water, it is broken to a simpler form by one species; this, in turn, is acted on by another species and so on. While now, with the prototype, they can generate power of around 1 watt per square-metre, they aim to get to about 5 watts per square-metre. This power can be used to sustain the process. Anjali Saraogi retained her title in the IDBI Federal Life Insurance Kolkata Marathon with a career-best timing today. Tlanding Wahlang won the men's full marathon. The 45 year old Saraogi achieved the feat less than three months after recovering from a surgery. Seniormost runner in the women's field, Anjali clocked 3 hours 16 minutes 54 seconds to win the race and better her last year's timing of 3 hours 30 minutes:53 seconds. Tlanding Wahlang clocked 2 hours:35 minutes :42 seconds to win the men's full marathon.